When I first heard about minimalism, I pictured the most barren-looking house imaginable. One fork and one spoon per person, one chair and no tv type of barren! It feels funny saying it now, but I was so deep in my own cluttered world that life without stuff was just that! A barren house, void of anything. Not only did I think it was living a barren life, but everything I heard made it sound so, dare I say, pompous and elitist. The people who I heard talk about this back then made it seem like I was the incarnate of evil for having five pairs of shoes! Immediately turned off and tuned out for a long time after those encounters. I started digging into simplifying different aspects of my life a few years later, looking what I could do and how I could improve. And look who popped up again, minimalism. I thought: not you again, buddy! But this time around, it was different. Granted there was still that elitist air to some of the supporters, however, there was a lot more positivity to counteract it. I finally found the answers to a lot of my questions and it just clicked. Someone else’s minimalism was not my own and I realized that where I was in my journey was not where someone else was. What they found to be cluttering their lives, I did not. I could borrow ideas and inspiration here and there, but it’s meant to be a fit for your life. Your minimalism is there to breathe and grow alongside with you, not be a blue print or even a cage. Some people can live with just one spoon and one fork, but that’s not how I chose my minimalism to be. Today, I wanted to share with you how to find your own minimalism. Is it right for you and how would it benefit you. Basic and easy information, with no elitism attached. PS: I still have those 5 pairs of shoes, and I’m not getting rid of them anytime soon. If you’re just starting your decluttering journey, take a peek at How to Start Decluttering & Live Minimally. This easy how-to will start you off on the right foot on how to start your journey or regain your focus. Easy to implement mindsets and motivation will have you decluttered in no time! 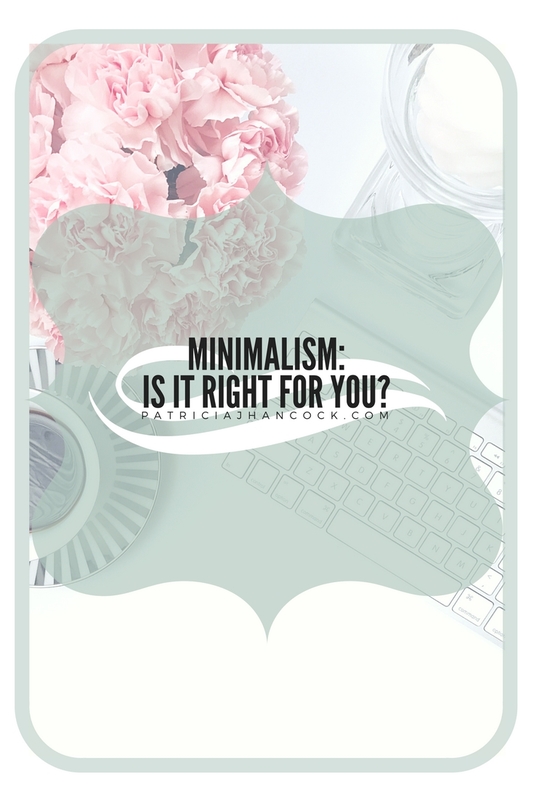 Are you looking for guidance in your minimalism journey, you're in the right place! Check out the Minimalism tag for all things minimalism related. Here you'll find every resource you need for your journey! These articles will help you start and continue your journey to your ideal minimalism that fits perfectly in your life. Looking for even more tips on how to declutter and wrangle your stuff? I got you covered! Check out the Declutteringtag for everything you need to get control back over your home and beat the mess. Have you wrangled most of the clutter in your life and are looking for tips to live more intentionally? The Intentional Living tag has steps to be more present and how to live focus on being meaningful in your journey. You’ve been getting more and more complicated as the years go on and goodness… when the end of the day comes, there’s still smoke coming off of your wheels. I’ve been there and the change starts when we simplify our routines, habits, and daily life. Minimalism is much more than just a home décor or fashion trend, it’s a mindset and an acceptance. It’s living intentionally and regaining your power in your life. Some people may divide this into existentialism as well as other terms, but at the end of the day, it still falls under the minimalism umbrella. This journey begins with your mindset. It’s taking that big ball of yarn and unraveling it down to a single thread: simplifying it by having less. When you have less to worry over, everything starts to not be so complicated. Think of it this way: there’s plenty of ways to make a sandwich. You can put an array of ingredients on the sandwich, you can toast the bread, you can even have your sandwich as a wrap! But when there’s so many options, the sandwich becomes a hassle. What if they’re sold out of red onions? What if the toaster burns the bread? If you keep your ingredients simple, you don’t run the risk of complicating much! Living Intentionally – Nurturing your "Why"
Minimalism is about living intentionally. This phrase gets kicked around a lot, but what does that even mean? Intentional living is about doing things that have a purpose, not just droning away mindlessly. It’s all about balance and honoring yourself enough to focus on what matters to you. When you live intentionally, you begin to understand your why. Why you live your life the way that you do. Day after day, we’re bombarded by everyone else’s ideas, to-do lists, suggestions, etc. without the back bone of our own intentions, we fall into these pits where everyone else controls our life. If we simplify our lives by having less to worry about and less to affect us, we start to grasp a true happiness that is our own. Knowing our purpose and our why brings us back to core values. These values keep you on your journey to where you want to go. Think of them as bumpers on the bowling lane! If you start to stray, take a look at your why and this will bump you back down your path. Minimalism is so easily lumped in with fashion or home décor, but it’s really only a fraction of those physical attributes. With minimalism, it comes down to having things that mean something and serve a purpose or function. It’s finding out what you need and why you need it. Everything always comes back to a why! Cutting out the unnecessary allows us to focus on what we allow in our lives. Going back to my 5 pairs of shoes, I enjoy them because I enjoy fashion, they bring me a certain happiness that only shoes can bring me. I rotate them around every other week, and I genuinely enjoy having them in my wardrobe. Are they necessary for me to live and survive? No. Are they serving a purpose? Yes, so they’re staying in my closet. Before I dove into minimalism, there were a lot more than 5 in my closet. I narrowed it down to the ones I have now which I enjoy having. Would 5 be excessive for others, of course, but again, we’re finding what works for us as individuals. If you’re feeling overwhelmed by stuff, then it’s time to start looking at what you wouldn’t miss if it wasn’t with you anymore. Take some time to go through each room and just see what you could get rid of. The biggest benefit of minimalism has to be the freedom, hands down. You’re not worrying about things or mindless tasks, you’re focusing your time and energy on what matters most to you. Your time becomes your own again because you’re not cleaning stuff that’s not being used, you’re not mindlessly plugging away at something that doesn’t matter to you. When you take it back to basics, there’s less to worry about. Minimalism isn’t a journey for everyone, but I know the feeling you’re going through. Sometimes you just feel stuck and overwhelmed all at the same time. Minimalism was able to help me overcome the struggles I was having, but it did not happen overnight. Knowing what it is and what it’s not will help you decide if it’s a tool you can use to achieve your goals and bring you closer to the happiness you deserve! Why did you start your minimalism journey? Leave a comment below to chat!